Bridge is an algorithmic film about architecture. The film is based on a collage of still-images of buildings in Tokyo, Japan. 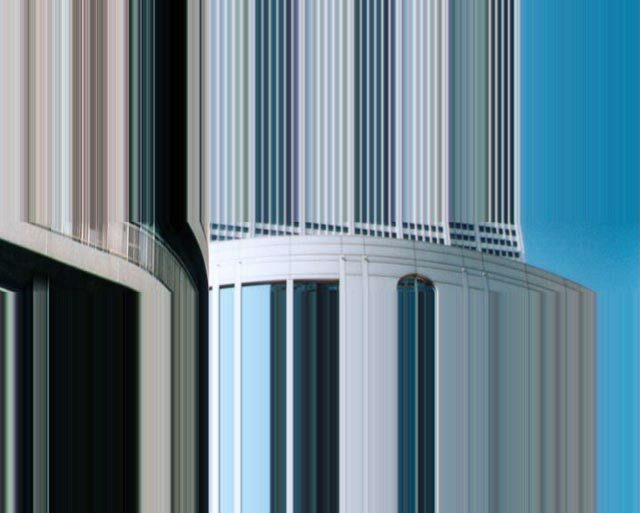 These tall structures are scanned vertically and are only see trough a small horizontal gap in the screen. The rest of the screen is filled with two single lines - the top and bottom of the gap repeated. As the gap moves through the image, these lines perform a slow and soft abstract animation. The scanning of the original image is the only movement in the film. The film is a more than 2 minutes long tilt. The proprietary software moves the image one pixel per frame / 25 pixels per second. Thus the duration is controlled by the height of the original image. Recorded 2000 in Japan / Processed 2003 in Denmark. Playing time: 2 min. 23 sec. Resolution: 720 x 576 / 25 fps. (PAL DVD). Concept and programming: Mogens Jacobsen.